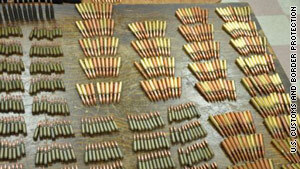 More than 2,880 rounds of ammunition has been found inside an SUV. (CNN) -- Federal agents seized 2,880 rounds of ammunition found inside an SUV that was being driven from Brownsville, Texas, to Mexico, U.S. Customs and Border Protection said. A 19-year-old Mexican was attempting to drive the 2003 Chevrolet Trailblazer across the bridge that links Brownsville with Matamoros, Tamaulipas state, when he was stopped for a secondary inspection, the release said. The ammunition, which included 13 armor-piercing rounds and five assault-rifle magazines, was hidden inside 18 plastic bags found inside the SUV, the release said.